Man Threatened With Eviction for Having ‘Too Many Books’! 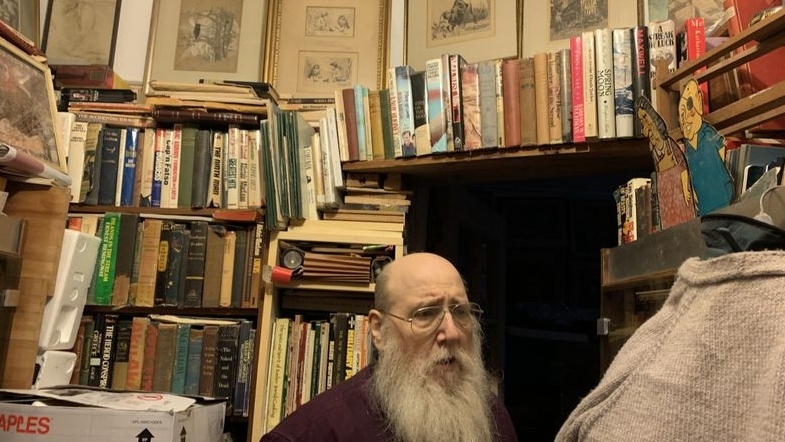 Longtime Brooklynite Ben Hammer, sixty-seven, is being threatened with eviction by his landlord after the latter declared that the conditions of Hammer’s one-bedroom apartment and the extensive library it contains pose a hazard to himself and the building he has lived in for the last forty-six years. According to The New York Daily News, the eviction notice from Benedict Realty Group states that Hammer’s living conditions — “boxes, bags, papers, debris, filing cabinets, wood crates and books piled from floor to ceiling throughout the apartment” — are unsanitary, and the building’s maintenance director was quoted as saying the books also pose a fire hazard. Hammer, who reportedly has no intention of vacating his apartment, will face his landlord in housing court next week backed by his lawyers and the Legal Aid Society. Hammer argues that Benedict Realty is attempting to evict him because he legally requested a freeze on his rent two years ago under SCRIE, the Senior Citizen Rent Increase Exemption Program. This means that Hammer pays a reduced rent, and the difference between his rate and the market rate is covered by property tax credit. According to its website, the Legal Aid Society is a nonprofit organization that helps New York City residents living below the poverty line access the resources they need to advocate for themselves in court. Hammer is steadfast in the face of a renter’s worst nightmare and insists his possessions hold value and he is legally permitted to remain in his apartment. Featured image via NY Daily News.